(Bloomberg) -- The rate of suicide deaths has been rising across the U.S. since at least 1999, according to new data released Thursday. But in some states, the increases are staggering. 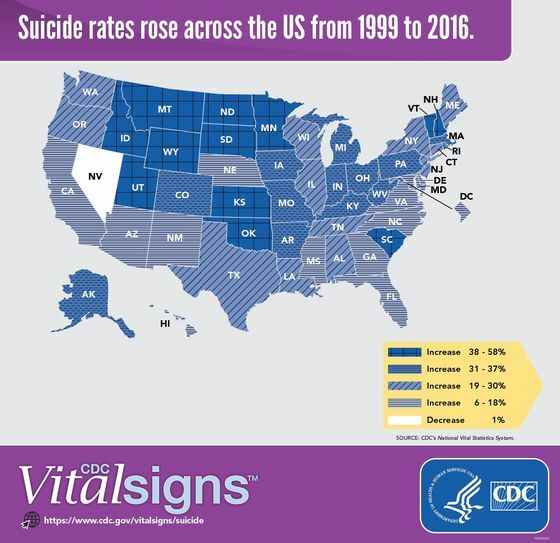 In North Dakota, the suicide rate increased by almost 58 percent from 1999 to 2016, according to a report from the Centers for Disease Control and Prevention. Of the 25 states where the suicide rate increase by more than 30 percent, the most noticeable rises occurred in western states. Montana, Idaho, the Dakotas and Wyoming all saw increases from 38 to 58 percent. In the east, Vermont, New Hampshire and South Carolina saw dramatic spikes as well. Suicide is the 10th-leading cause of death in the U.S., and rates have been climbing steadily for years. There were 44,965 suicide deaths in 2016, according to CDC data. Approximately half of such deaths involve the use of a firearm. While mental health is often a factor, the CDC cautioned that there is no single reason for the nearly 30 percent nationwide increase between 1999 and 2016, pointing to the finding that approximately half of those who died by suicide did not have a known mental health condition. Suicide prevention largely focuses on addressing mental health treatment, the CDC found, suggesting that a wider variety of preventive measures could be taken. The findings point to the need both to address the circumstances associated with the onset of mental health conditions—such as relationship, financial or criminal problems—and to support those with known mental conditions to decrease the risk of suicide, the CDC said.